What’s a flower girl? She walks the wedding processional preceding the bride wearing the cutest and liveliest flower girl dress. A flower girl symbolizes the stunning bride’s transition from a young, little girl. How to choose the right flower girl dress? First, the dress should be comfortable. The material of the dress should not be itchy or too hot nor cold for the occasion. Second, the length should be enough that when she walks on the aisle, she won’t trip or pull her dress. Third, the dress should be cute and charming and goes with the whole wedding theme. Straight Cut flower girl dress can make your flower girl look like a little princess or fairy depending on design. It can have a sash or a bow for added loveliness. Long or short tutu for flower girls can make your little member look very charming and cute. You can make a lot of experiments with a tutu flower girl dress. 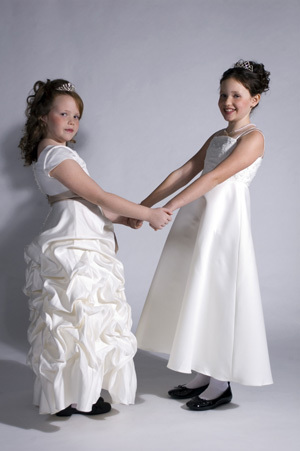 A-line flower girl dresses are the most common dress design for flower girls. It can give a lot of options for the dress designers while maintaining the girl’s youthful look. Sometimes, flower girls even have dresses that are miniature sizes of the bride’s wedding gown. Check out other wedding sites and wedding shops. The little girls should be charming and beautiful as they entertain the guests during the wedding ceremony.